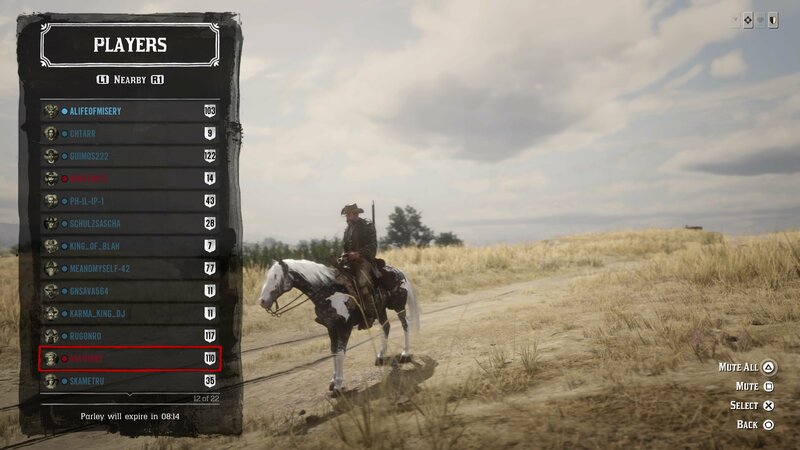 While headed to the butcher in Saint Denis with an unskinned three star Buck. So much of what people are defining as "griefing" actually...isn't. Sorry, somebody shooting at you in Free Roam isn't "griefing" you. It's a game with guns. Free as in FREE Roam. Even stealing pelts is part of the game mechanics or they'd have coded it so once you get a pelt it belongs only to you. The only really true griefing and trolling I experience is people actively trying to ruin Story Missions or people who shoot my horse just to shoot my horse but even THEN it's in FREE Roam. Some of these videos are fun to watch. Griefer or not. They're scumbags that much is certain. And there'll be more videos about people who play stupid games, and win stupid prizes. I've never parlayed once. Odd sort of projection going on here. "Psychological projection is a defense mechanism in which the human ego defends itself against unconscious impulses or qualities (both positive and negative) by denying their existence in themselves while attributing them to others." No but you hide in your camp after shooting someone with a sniper. That's pretty much the same I'd say. "A griefer or bad faith player is a player in a multiplayer video game who deliberately irritates and harasses other players within the game (trolling), using aspects of the game in unintended ways." Keep hiding in your camp after sniping is "using aspects of the game in unintended ways"
followed by the sweet taste of a parlay. That Rockstar allows it is not a justification. Rockstar allows you to be lasso'd while fishing. Both are a questionable actions. Griefing is part of the entertainment and Rockstar is fostering pvp. It also allows me to exact revenge for educational purposes. Calling them griefers is fine, folks. No need to get petty. This is an extremely valid point. IMO gamers have become a lot more touchy about what they consider Griefing or Trolling with regards to Red Dead. Getting shot, having my car blown up or horse killed, this was just standard Rockstar stuff. Now literally anything people don't like is "Griefing". Sure you don't like being lassoed and dragged about. Yet Rockstar has an achievement for just that! 2 actually, lasso from horseback and drag from horse. Just an example. What they overlooked was how differently people want to play this game. I attribute a lot of it to Single Player being SO immersive, spending so much time doing whatever you like as Arthur with some minor interruptions from bandits or animals that this mentality carried over to RDO. Most people want to continue on as they had in Single Player just with more people to interact with and seem shocked/angered that others are lock step in line with how THEY want to play. So the behaviors haven't changed. Certainly a much more tame world than GTAO or even the first Red Dead Redemption. It's the expectations that have changed. Lord knows there was a thread on the old RD site about shooting horses. It was super comical! Everyone sharing their got shot or did the shooting stories. Fun thread! I couldn't IMAGINE such a thread here nowadays! The crying it would creat! It's not the behaviors that have changed it's how people react to them when really if gaming makes people so angry they should put down the controller. Meanwhile, most of the users here are griefers to me. man, some low rank (5) killed me while I was looting corpses at mount hagen and sabotaged my stranger mission. I killed him 3x and then he finally parlayed. hope that taught him a lesson not to interrupt people during missions - and to not shoot others in the back! the last kill was very satisfying I have to admit....sniped him from across the mountains as he was riding off through the forest with all its snowy trees. oh boy he did NOT see that last kill coming! me neither tbh...trees, snow, glimpses of him on his horse. I think I closed my eyes for a second or two and was just feeling it...almost like kevin costner in "bodyguard"...nahmean?! First segment, a low level greifer tried to get a cheap kill. Second segment, getting back at him on behalf of Sadie, the Gold Turkoman he almost killed. Second clip reminded me of this. Not only that but theres an award for killing players by shooting them in the back, not "enemies", no it's specifically players. Please return to topic from this point on. There's nothing further to say. The shooting from behind award is specific to other players, however, the lasso and drag from horseback actually says "enemies", so NPC enemies should count. Sorry Uncle Sikee Atric, I must have been typing as you posted. Delete my post if necessary. Edit: Removing after mod post, not relevant. This thread is not another thread to discuss what's griefing or not. Fair enough man, just be aware that applies to you guys too. For my latest encounter I spawned up in ambarino on the other side of that small lake east of Wapiti, just along the road. I'm sitting on my horse getting ready to head out when I notice one of them moving up the road towards me. He's a low level so I don't think much of it and I think he even waved, then proceeded to shoot me in the head from like 10 feet away. That was annoying obviously so I then proceeded to kill him and his buddy over and over till I got bored (maybe 3-4 kills each). I just don't get what goes into that mentality of "oh hey a player is/spawned over here, lets go see them then shoot them for no reason!" I mean I dunno, maybe they enjoy the resulting slaughter they receive? All in all I like the thread man, keep those vids coming. I'm taking a break from punishing until I get the 5th stable slot. It's too expensive serving justice atm. Dunno if I'd call this justice but this random wore out his welcome lingering around my kill. I think that's fine. People need to stay out of your gang hideout. I kill everyone who interferes with my hideouts. THEY'RE MIIIINE! The "what is griefing?" conversation isn't going anywhere. Like ol' Uncle Sikee and OP requested, keep the thread on topic from here on out please and thank you. just remember blue dot players can turn on you, so it might have been justice. I've found players looting my kills at MY gang hideouts more than once. This goofball's rampage ends horribly wrong...for him. I'm always watching. Lol blacklung was his GT you know that kinda guy is going to be a jerk. Nice shot dude.